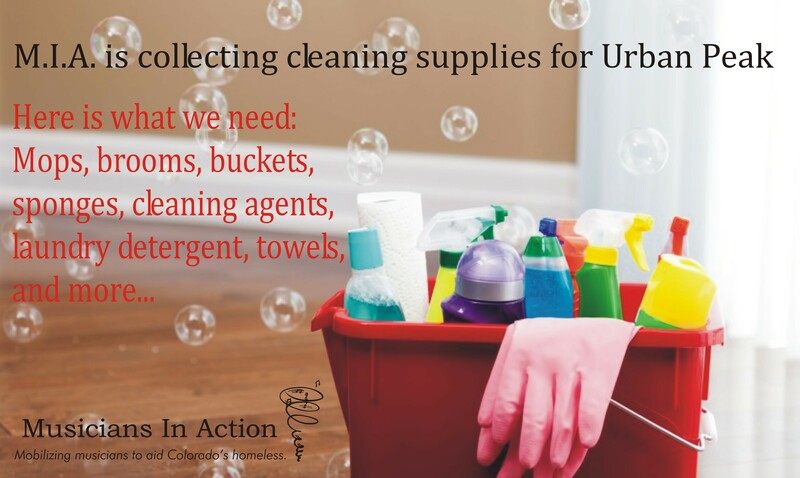 Musicians In Action-CO is collecting cleaning supplies for teens at Urban Peak through the end of the year. Will you help us? We are looking for: brooms, mops, buckets, cleaning solutions of all kinds, sponges, laundry detergent, vacuum cleaners, etc. M.I.A. will have physical donation sites at two music events in December: on the 2nd at the Toad Tavern in Littleton ($8 cover charge) and on the 9th at G.I. Jodi’s (also in Littleton, no cover charge). We’ll have CDs and T-shirts available for donations as well. All proceeds will be used to purchase more cleaning supplies for UP. Can’t make one of these shows? Then please email Marc at Musicians In Action.org for a convenient pickup time. Thanks for your support!